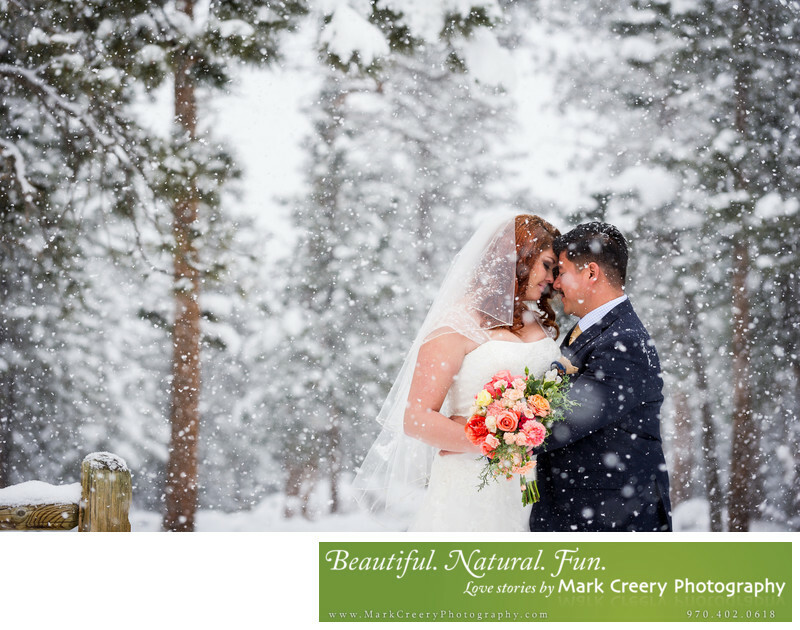 I am a YMCA of the Rockies experienced wedding photographer who excels at capturing Estes Park weddings and the amazing scenery the area offers. This photo was taken in March after the couple's ceremony at Ponder Chapel. There was no snow on the ground the day before, but it ended up snowing a foot during the day. Instead of hiding from the cold and heavy wet snow, we went out to capture some unbelievable shots. The huge white snowflakes added an extra dimension to the photos. In fact, it was so snowy that I had a hard time auto-focusing and had to change to manual focus, as my camera had a hard time seeing through all the white. It was the most serene setting and rare to have that much snow on a wedding day in Colorado, where the sun shines most of the time. I have photographed all around the YMCA of the Rockies property, so I know great spots that will get you the wedding photography you want. Ceremony locations include the scenic Overlook Chapel, with it's wooden deck overlooking RMNP and room for 100 guests, Sara Smith Outdoor Chapel with space for up to 150 people, Hyde Chapel (capacity of 480 guests), Ponder Chapel (120 people), Dannen Chapel (50 guests max), the Pine Room, Walnut Room, Assembly Hall, and the Upper Cookout Pavilion. If you are organized you can book many of the cabins so your guests can stay on-site and you can have your preparation photos taken there. The YMCA of the Rockies is located in Estes Park, Colorado. Contact: (970) 586-3341 x 1024. Location: 2515 Tunnel Rd, Estes Park, CO 80511.